THE WONDERFUL DRAUGHT OF FISHES. NE DAY, AS the crowds pressed round Him to hear the Word of God, Jesus came to the Lake of Gennesaret and saw two boats drawn up on the shore. Now one of these belonged to a man named Simon Peter, who was at the water's edge washing his nets. Jesus entered into this boat and asked Simon to push it off from the land a little. Then He sat down and taught the people from the boat. And when He had done speaking to them He said to Simon, "Launch out into the deep, and let down your nets for a draught of fishes." Simon, answering Him, said, "Master, we have toiled all through the night and have taken nothing, but as you wish it I will let down the net again." And they let down the net into the sea, but it enclosed so great a multitude of fishes that they could not draw them up; and the net brake. Then Simon beckoned to his partners, James and John, who were in the other boat, that they should come and help them. 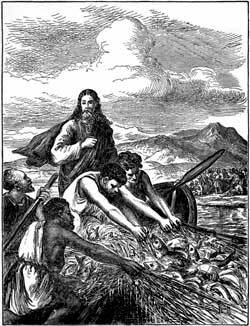 And they came and filled both boats with the fishes, so that they began to sink.